SXG323 and SXG326 specializing in cutting and collecting grass satisfy various demands of professional users and municipalities. 1123cc engine is powerful with max. 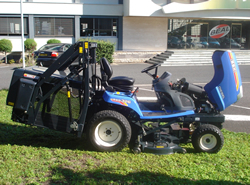 21.9PS and 23.4PS and useful with 21L of large fuel tank contributing to extention of uninterrupted mowing time. Large capacity of HST enables excellent traveling and climbing performance. 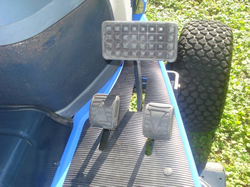 2 foot pedals to forward and reverse traveling at any time is definitely suitable for better maneuverability. 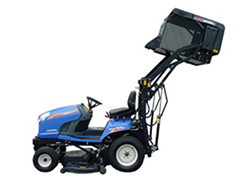 Both of 54-inch and 48-inch mower decks are available with collector. 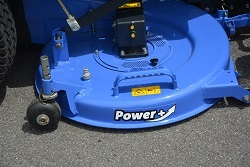 48-inch mower deck with large overlap of 2 blades cuts grass perfectly. Air intake on the mower deck makes it possible to cut grass accurately on sports grounds. 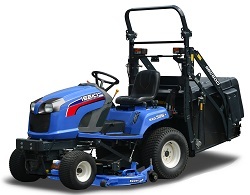 54-inch mulching mower deck is also available for ensuring excellect mulch. 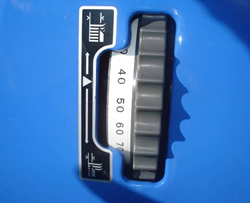 Cutting height can be easily adjusted by a dial on LH side fender. 620L of high dump collector and 550L of low dump collector are available. Wide collector chute carries grass smoothly. Both collectors can be quickly attached and detached without tools. Fully open engine bonnet is quite comfortable for daily maintenance. Road homologated models are also available. All Rights Reserved. Copyright(C)1997-2014,ISEKI & CO.,LTD.